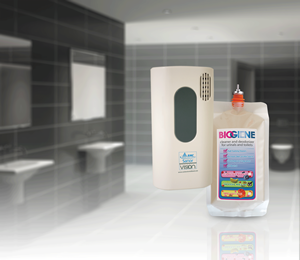 Our Sanor Hygiene Vision is a contemporary state of the art Cleaning and fragrancing system providing much of the same benefits as our Sanor Mark-V program. A detergent rich fluid along with a very aesthetic fragrance fluid drip system drips cleaning fluid through an automated mechanism, directly into urinal and toilet bowl fixtures while consistently fragrancing the air using a revolutionary wick technology. The dispensing system has a customized, programmable capability, for ultimate control with a user friendly LCD display that permits a 30-60 day operating cycle. The Biogenius fluid inside, comes packaged in a 600 ml recyclable bag, which clearly eliminates the disposal of plastic bottles in our waste.